To be honest, I intended to publish a post that was ready to go for a while. But when a friend of mine showed me that article (in French), here is an equivalent in English, I changed my mind. Those articles speak about teaching code to young girls thanks to Disney Princesses and breaking stereotypes about computer science. And that is a subject I hold dear to my heart. I understand that programming sounds intimidating to a lot of people, and especially to girls. That’s why I would like to share my story with you. I am not a feminist or an activist of any kind. But I strongly believe that everyone should be equal towards education, and that everyone should have the same chance to learn what they want. I had the chance to be raised as a kid, not as a girl, but just as any kid encouraged to be curious. I received the same education than my brothers, without any stereotype about science or literature. Thank you Mom and Dad for that. When I studied Science and then Computer Science, it was natural to me because I found it very exciting to create things with my own two hands. I was amazed to see that I could tell the computer to do things and to see them happening on the screen. It was a bit magical, but it was cool and I liked it! Then, when I started working, I heard two kind of reactions when people asked about my job. About Reaction 1, it is really funny to see that people don’t understand that there is something behind what they see on a website or an app. For the majority of people, when they click on a button, some magic happens. That’s it. Sorry to disappoint you, but it’s not really “magic”, developers write code to make the button do something. That’s how it works. I know it sounds intimidating, but you don’t have to be a genius to read or write code. You just need to be curious and determined. We just write in a different language after all. Now, let’s talk about the second reaction. It has been scientifically proven that there is no “male” of “female” brain. And it is not the size that matters, but the way you use it! Basically, the more you use your brain, the more you create connexions between your neurons, the better it gets for you! That’s how it works. If there are differences between boys and girls, it is mainly due to education. 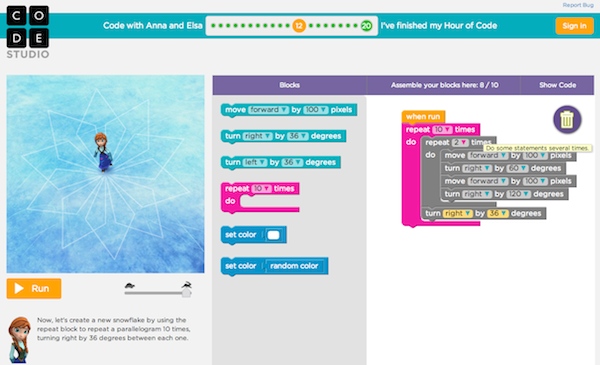 That is the reason why they created that brilliant project in collaboration with Disney: Code with Anna and Elsa. The interesting fact is that it is actually Disney that approached them for this project. And who else but those two strong and independent Princesses could do the job? I tried it (look at what I’ve done :), and I recon it is pretty well made. They give you the instructions, and you can watch an explanatory video if needed. Then you drag and drop the code elements from the toolbox to the workspace, change some parameters and run it! It is progressive, rewarding and quite fun. In this project the logic is emphasised rather than the code so it may seem less scary. But the wording (instruction, loop, function) is there, and that’s a very good start. I know that breaking the stereotypes about computer science is a very big challenge, and I don’t expect any non-developer to understand what we do right after reading this article. But I just want you to know that if you’re a bit curious, you can have a glimpse of “how things work”. Also, I’ve seen some encouraging changes happening over the years: the big and small tech companies made a huge effort to change the developer’s image and attract them in their cool and fun workspaces. Geeks no longer appear as the dirty no-life guys who live and work in a garage, eating pizza. We are kind of cool now, we build apps for your smartphone and websites that you use every day. So, we are not crazy geniuses or wizards, but it seems like we have some superpowers… and we can share them with you!